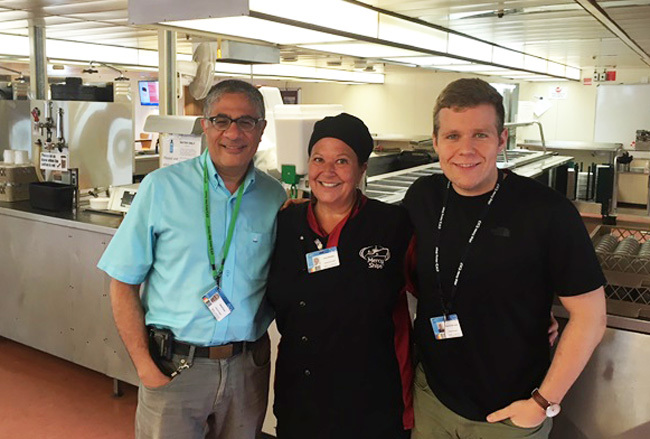 In his fourth dispatch aboard the Africa Mercy hospital ship, Dr. Sherif Emil writes about Irene Blotsky, a former nurse who volunteers in the ship’s kitchen. It’s 09:15 on Sunday morning. Etienne St-Louis, a McGill surgical resident, has been with me on the Ship for one week. We’ve seen our share of challenges in the operating room over the past week, and we are finishing a quiet breakfast, calmly content with many witnessed miracles since our arrival. Etienne will be on call today and I will leave the Ship briefly to attend a Palm Sunday service at the Hope Centre, the residence housing Africa Mercy patients recovering from surgery and those awaiting surgery, along with their families. But before I leave, I decide to do something different. I have been interviewed several times leading up to, and during, my mission. Today, I get to be the interviewer. And I decide not to interview a doctor, nurse, or other health care professional. I’ve written much about their amazing work. Rather, I’ll interview a woman who on the surface seems far removed from the hospital setting. Irene Blotsky just completed her breakfast shift in the Africa Mercy kitchen, serving close to 400 crew members from all corners of the earth. She is a bubbly, fun, unassuming woman – one of the hundreds of volunteers on the Ship. Irene has been here for six weeks, and she has another week to go before returning home – to Montreal. Irene heard about the Africa Mercy through a piece in the Montreal Gazette and decided she wants to come to serve. But Irene is not a chef, a cook, or a waitress. She is a nurse. Her entire career has been in Montreal. She has worked in ICU’s, in-patient units, outpatient clinics, CLSC’s, you name it. After 35 years, she retired from nursing, but not from service. She still volunteers on the Oncology Unit of the Children’s every Wednesday, baking goodies for the hard-working nurses taking care of the some of the most vulnerable patients. Irene came to the Africa Mercy to work in the kitchen because, after retiring, she had not renewed her nursing license and she wanted to serve in new ways. Despite one knee already replaced and the other about to be replaced, she walks literally several miles a day back and forth in the enormous kitchen. She may not directly attend to a single patient during her stay, but she feels intensely close to the patients. She knows and feels that she is an indivisible part of this community she just joined a few weeks ago. “Everyone here is made to feel as important as the other”, she tells me. The spirit of the Africa Mercy community has not just met her expectations. It has far exceeded them. It does not take long for a volunteer on the Ship to both be nurtured, as well as to nurture others. Irene has had a long and productive life. In addition to an illustrious nursing career, she raised 3 successful children. She is a grandmother. But here on the Ship, she is a student like the rest of us – constantly learning from a community as unique as the service it provides. “I am a changed person,” she tells me, “but I still have not fully processed the extent of what I’ve seen and learned here”. “I’m coming back”, she says with resolve. Two days ago, most of the Canadian crew went to dinner at a nearby restaurant. Irene’s story is duplicated in so many – nurses, ship officers, physiotherapists, capacity builders, pharmacists, biomedical engineers, teachers, and more. Some are here for a few weeks. Some have been here for years. But all share in, and contribute to, this unique community of care and compassion. They come from all corners of the country and are Canada’s ambassadors to Mercy Ships. And they do Canada proud. Each is an Irene Blotsky of one sort or another – stepping out of their comfort zone to contribute to a mission of mercy. I am so excited to meet and get to know Irene. Now I have someone at the Children’s who knows and understands the culture of the Africa Mercy. Each time we meet, we will give each other a big hug and remember this very special place where we met. Dr. Sherif Emil is a pediatric surgeon at the Montreal Children’s Hospital and a professor of pediatric surgery at McGill. Dr. Emil was recently in Douala, Cameroon, on his third mission to the Africa Mercy. The Africa Mercy is the world’s largest civilian hospital ship dedicated to bringing hope and healing to tens of thousands of the world’s impoverished populations. This is the fourth instalment of Dr. Emil’s dispatches from aboard the Africa Mercy.